Through December 31, IHOP is selling Miracle Balloons and footballs to support Children’s Miracle Network Hospitals across the country. The holiday campaign is in addition to the icon campaign that will lead up to National Pancake Day on March 7, 2017. Pancake artist Nathan Shields (@SaiPancakes) created some new holiday pancake designs to get customers into the spirit of giving to CMN Hospitals this charitable season. 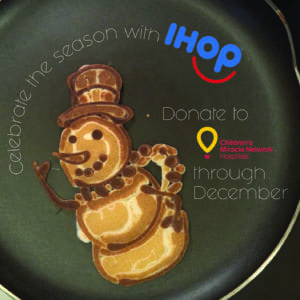 Funds raised by IHOP customer donations support 121 children’s hospitals. Thank you for making the season brighter for sick and injured children. Comments for Donate at IHOP this holiday season! Previous post: WOBM Shawn & Sue's Making Miracles Radiothon on GIVING TUESDAY! Next post: Top 16 Moments from 2016!